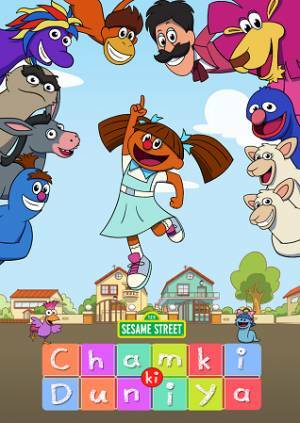 Turner Broadcasting and Sesame Workshop, the non-profit educational organisation, announce the launch of Chamki ki Duniya. The new preschool educational series airs on Turner’s kids’ channel POGO on weekdays at 8:30am. Chamki ki Duniya is the second venture between Turner and Sesame Workshop. Previously, both companies had partnered to create five seasons of Galli Galli Sim Sim, the Indian adaptation of the popular American series, Sesame Street. Inspidea, an animation studio in Kuala Lumpur, has been commissioned for the animation of the series. Chamki ki Duniya takes young viewers on a journey with five-year-old Chamki, an adventurous and inquisitive schoolgirl, anxious to learn more about the world. A warm, sensitive and friendly girl, Chamki is always surrounded by her group of friends from thegalli, who love playing games, making music and solving mysteries around them. Chamki ki Duniya addresses topics such as early literacy, creative thinking and reasoning, family and community life, healthy habits, appreciating cultural plurality and many more via compelling and humorous stories, music and art. The series is targeted towards children between two and six years of age. Say Goodbye to your favourite TV shows this Summer! Zee Cafe to air the entire Season 3 of House of Cards in Two Days! Quikr Nxt's new campaign introduces Voice Chat!